Sometimes we will update the JMRI decoder files before they get included in JMRI. This file explains how to update them. 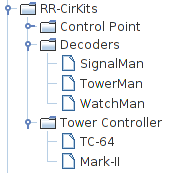 JMRI Decoder files are required to configure many of our RR-CirKits products. If you have not updated to the most recent version of JMRI you may not have the current versions of these files. There are two places in the JMRI program files area where you find the decoder files. The first is in the folder JMRI/xml/decoders where the primary decoder files for all manufacturers is located. The second place isthe folder JMRI/xml/decoders/rr-cirkits which is reserved just for specific RR-CirKits files. The primary difficulty is getting the new files in the correct locations. The advantage of updating these files is that you can use the latest hardware before the files are generally available. The first is decoders.zip and the second is rr-cirkits.zip. Download and unzip them now. First be sure that you are using the most current version of JMRI. These files expect test release 3.7.2 or later. Once you have the files and folders recreated, move them to the appropriate locations. The files found in the decoders folder should be placed in the program folder JMRI/xml/decoders where they will replace some and add new files. The files found in the rr-cirkits folder will be placed in the program folderJMRI/xml/decoders/rr-cirkits where they may over write some files with newer dates and will add some new files as well. Once the files have been updated then open JMRI and go to the Debug drop down list and select Recreate Decoder Index and Update Decoder Definitions. Once you restart JMRI you should find these decoders listed under RR-CirKits.